IXPs reduce the portion of an ISP's traffic that must be delivered via their upstream transit providers, thereby reducing the average per-bit delivery cost of their service. Furthermore, the increased number of paths available through the IXP improves routing efficiency and fault-tolerance. In addition, IXPs exhibit the characteristics of what economists call the network effect. The primary purpose of an IXP is to allow networks to interconnect directly, via the exchange, rather than through one or more third-party networks. The primary advantages of direct interconnection are cost, latency, and bandwidth. The third advantage, speed, is most noticeable in areas that have poorly developed long-distance connections. ISPs in these regions might have to pay between 10 or 100 times more for data transport than ISPs in North America, Europe, or Japan. Therefore, these ISPs typically have slower, more limited connections to the rest of the Internet. However, a connection to a local IXP may allow them to transfer data without limit, and without cost, vastly improving the bandwidth between customers of the two adjacent ISPs. Asynchronous Transfer Mode (ATM) switches were briefly used at a few IXPs in the late 1990s, accounting for approximately 4% of the market at their peak, and there was an attempt by Stockholm-based IXP NetNod to use SRP/DPT, but Ethernet has prevailed, accounting for more than 95% of all existing Internet exchange switch fabrics. All Ethernet port speeds are to be found at modern IXPs, ranging from 10 Mb/second ports in use in small developing-country IXPs, to ganged 10 Gb/second ports in major centers like Seoul, New York, London, Frankfurt, Amsterdam, and Palo Alto. 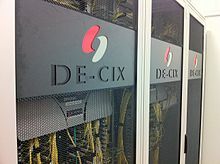 Ports with 100 Gb/second are available, for example, at the AMS-IX in Amsterdam and at the DE-CIX in Frankfurt. The technical and business logistics of traffic exchange between ISPs is governed by mutual peering agreements. Under such agreements, traffic is often exchanged without compensation. When an IXP incurs operating costs, they are typically shared among all of its participants. At the more expensive exchanges, participants pay a monthly or annual fee, usually determined by the speed of the port or ports which they are using. Fees based on volume of traffic are less common because they provide a counterincentive to growth of the exchange. Some exchanges charge a setup fee to offset the costs of the switch port and any media adaptors (gigabit interface converters, small form-factor pluggable transceivers, XFP transceivers, XENPAKs, etc.) that the new participant requires. Diagram of the Layer 1 (physical) and Layer 2 (Data Link) topology of an Internet Exchange Point (IXP). Diagram of the Layer 3 (network) topology of an Internet Exchange Point (IXP). Internet traffic exchange between two participants on an IXP is facilitated by Border Gateway Protocol (BGP) routing configurations between them. They choose to announce routes via the peering relationship – either routes to their own addresses, or routes to addresses of other ISPs that they connect to, possibly via other mechanisms. The other party to the peering can then apply route filtering, where it chooses to accept those routes, and route traffic accordingly, or to ignore those routes, and use other routes to reach those addresses. 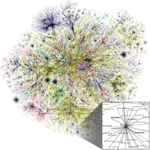 When these conditions are met, and a contractual structure exists to create a market to purchase network services, the IXP is sometimes called a "transit exchange". The Vancouver Transit Exchange, for example, is described as a "shopping mall" of service providers at one central location, making it easy to switch providers, "as simple as getting a VLAN to a new provider". The VTE is run by BCNET, a public entity. Advocates of green broadband schemes and more competitive telecommunications services often advocate aggressive expansion of transit exchanges into every municipal area network so that competing service providers can place such equipment as video on demand hosts and PSTN switches to serve existing phone equipment, without being answerable to any monopoly incumbent. Euro-IX (European Internet Exchange Association), the first association of Internet exchange points, was formed in May 2001. The Internet Exchange Federation (IX-F), which includes Euro-IX, APIX (Asia Pacific Internet Exchange Association), and LAC-IX (Latin America & Caribbean Internet Exchange Association), was formed in November 2012. The African Internet Exchange Association (Af-IX) joined the Internet Exchange Federation on 7 October 2014. ^ "The Art of Peering - The IX Playbook". Retrieved 18 April 2015. ^ "Internet Service Providers and Peering v3.0". Retrieved 18 April 2015. ^ a b c "Global Internet Exchange Points / BGP Peering Points / IXP". BGP: The Border Gateway Protocol Advanced Internet Routing Resources. Bgp4.as. 20 October 2011. Retrieved 30 October 2015. ^ "IXPs". Internet Society. Retrieved 20 February 2018. ^ BCnet (4 June 2009). "Transit Exchange helps Novus Entertainment Save on Internet Costs and Improve Performance". How R&E networks can help small business. Bill St. Arnaud. Retrieved 11 September 2012. ^ "Euro-IX Website". European Internet Exchange. Archived from the original on 13 April 2015. ^ a b "IX-F Website". Internet eXchange Federation.